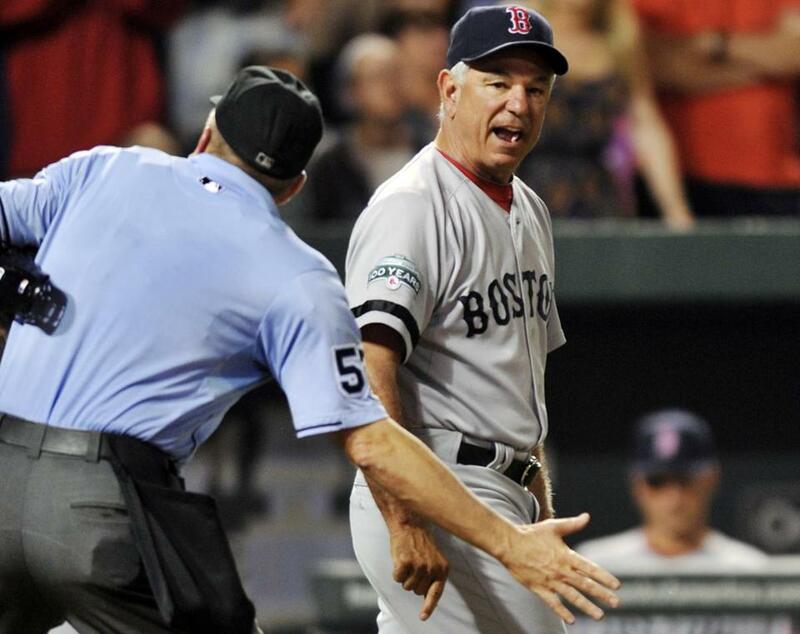 Bobby Valentine also gets the heave-ho from plate umpire Mike Everitt after Adrian Gonzalez was ejected in the eighth. BALTIMORE — In the aftermath of this week’s Yahoo! Sports story of a reported mutiny by Red Sox players against manager Bobby Valentine, there were strong denials from players and owner John Henry Wednesday, and emerging as a major issue for upper Sox management is concern over the sources cited in the story and their motivation. “We are very concerned about a breach of confidence in this matter because in the 10 years we’ve held these meetings, we’ve never had information leak like this,” said Larry Lucchino, the team’s president and CEO. The report, which detailed a meeting between ownership and a group of players in New York late in July, prompted Henry to issue a statement Wednesday in which he, too, expressed concern about the leaks and insisted that no player called for Valentine to be fired. “For more than a decade we have had a code among players, staff, and ownership that our meetings are private and do not leave the room,’’ Henry wrote. “There is one reason for that. It enables all of us to openly discuss important issues. “For more than a decade, not one person in any of those meetings has gone to the media with private information. Over the decade we have made great strides as a result of these meetings in a number of ways, including improvement in training facilities, protocols, safety, resources, travel issues, clubhouse issues, and trust within a cooperative framework. “But more than anything else these meetings have been about the same thing the meeting in New York was about — what it takes to win, what can we all do to improve our ability to win? “What Tom, Larry, and I heard in the player meeting was one overriding sentiment. Players felt responsible for the record. They weren’t blaming injuries or anyone but themselves. Lucchino reiterated Henry’s assertion that at no time did players gang up on Valentine and call for his firing. A team source said someone “definitely had an ax to grind” with the manager. According to a team source, Dustin Pedroia and Adrian Gonzalez, the two players cited in the Yahoo! story as the most vocal at the meeting, asked to speak to Valentine prior to Tuesday night’s game to explain what happened and to assure him that they were not trying to get him fired and in fact enjoyed playing for him. Before Wednesday night’s game, Valentine expressed confidence that his players were not trying to get him fired, while also wondering about the motivation of the sources used in the story. Said a prominent Red Sox player, “If I knew it was one of my teammates, we’d have a big problem. A big problem. “I think that bothers everyone,” said DH David Ortiz. “We’re supposed to be a baseball team. We’re supposed to come in here and think of the best way to win as a team. Not this other crap. Asked if this latest drama to hit the clubhouse was beginning to weigh on him or the team, Valentine said, “I don’t know if it’s weighing on me, but the guys are upset that every time we win a game, something else pops out of the bag of tricks. Valentine thinks the end result could be the team coming together. “I think we’re in it together, personally, and I think we’re going to get hot,’’ Valentine said. According to a team source, among the things discussed in the July 26 meeting were Valentine leaving Jon Lester in a July 22 game to give up 11 runs, and a sarcastic comment Valentine made to rookie Will Middlebrooks after two misplays in an inning. Regarding the July 22 game, Valentine said he had apprised Lester that the lefty would have to pitch because the bullpen was thin, and that Lester agreed. Since then, according to both Pedroia and Valentine, they have gotten along very well. Before Tuesday’s game, in fact, Valentine came over to Pedroia in the dugout, put his hand around his neck, and kissed him. “It’s an Italian thing,” Valentine said. “This kid is one of the greatest people I’ve ever managed. He’s a warrior. He gives you everything he has every day.